"We all have our roles to play." Order your own copy of Underhand of the Emperor at your local retailer or online through our website today! 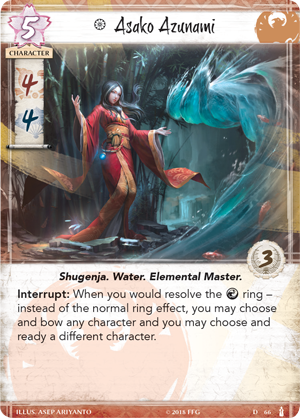 While the Underhand of the Emperor Clan Pack for Legend of the Five Rings: The Card Game focuses on the cunning Scorpion, there are still plenty of tools present for the other Great Clans of Rokugan. As with Disciples of the Void, this expansion features three copies of one new character for each of the six other clans, as well as several new neutral cards for use in any deck. With this in mind, the Scorpion won't be the only clan to receive a boost when this new expansion releases in October. 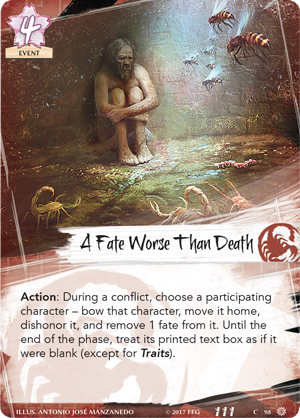 Join us today as we take a look at these non-Scorpion cards found in Underhand of the Emperor! 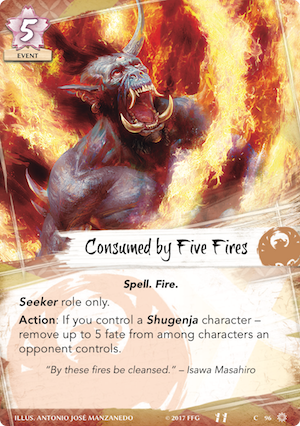 With an elemental imbalance in full effect, the Phoenix have become weakened, their powerful shugenja struggling to harness the powers they once wielded effortlessly. Their leaders worry that the Scorpion could take advantage of this, using this vulnerability for their own machinations and schemes. But the guardians of the Emperor's soul still have plenty of power. 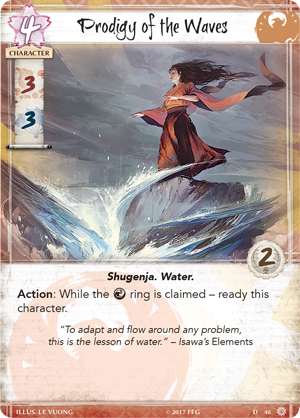 Asako Maezawa (Underhand of the Emperor, 15) enters Legend of the Five Rings: The Card Game as a supportive political character. When he is participating in a conflict, if you have more glory among ready participating characters than your opponent, you can double a character’s base political skill until the end of the conflict. Maezawa can be an ideal target for his own ability, granting you three additional political skill, but Asako Azunami (The Ebb and Flow, 66), the Chikai Order Protector (The Fires Within, 48), and the Prodigy of the Waves (Into the Forbidden City, 46) are also valuable targets. Since Scorpion characters traditionally have little glory, Asako Maezawa will nearly always be successful in that matchup, allowing the Phoenix to stand up to the Scorpion in the political arena through glory alone. 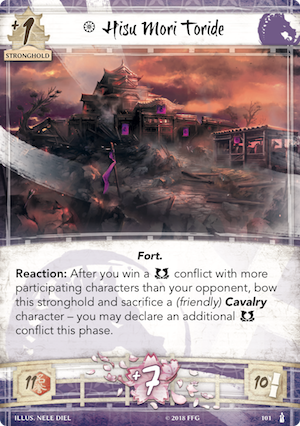 Perhaps more than any other clan, the Unicorn are cautious about dealing with the Scorpion, because the Scorpion have shown their true colors time and time again in Ryoko Owari, the great city from which both clans base their opium trade. For their part, the Scorpion watch. Are the Phoenix correct in their foreboding assessments? Is there a sinister nature in the Unicorn's meishōdō magic? Utaku Testsuko (Underhand of the Emperor, 16) enters the game as one of the Unicorn’s greatest weapons against the Scorpion. 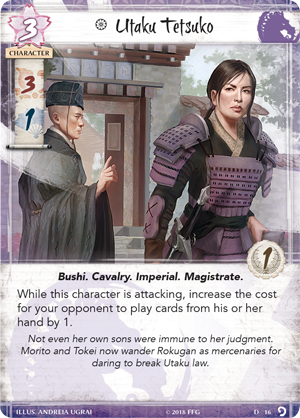 An Imperial Magistrate, Tetsuko punishes clans who rely on conflict cards to aid them in their battles. When Tetsuko is attacking, every card your opponent plays will cost one additional fate! This tax on conflict cards will undoubtedly have your opponent treading carefully when defending. 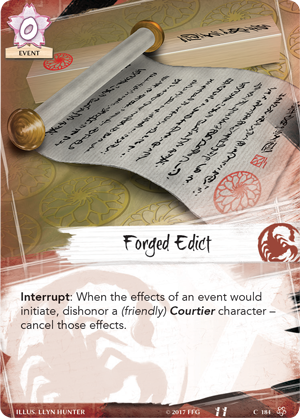 Some of the Scorpion’s strongest conflict cards are so effective because of their low fate cost, like Forged Edict (Core Set, 184). While Tetsuko is attacking, the Scorpion now have to pay fate and dishonor a Courtier to get the desired effect. The Scorpion can have as many cards in their hand as they would like, if they don’t have the fate to pay for them, they are useless. With the Cavalry trait, Utaku Tetsuko fits neatly into the pantheon of Unicorn dynasty characters. 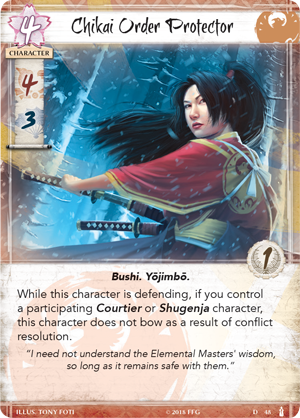 Not only can she help activate Hisu Mori Toride (Elements Unbound, 101), but three military skill plays right into the strengths of the clan that rides. 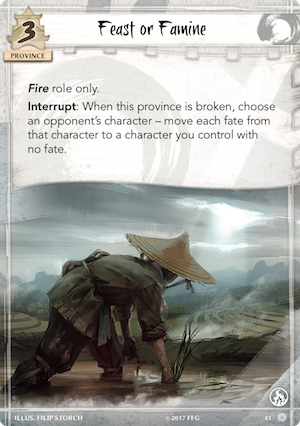 Rokugan is not simply made up of the seven Great Clans, and Underhand of the Emperor also includes several neutral cards. While these cards can be used with any clan, their theme of politics, trickery, and utilizing obscure resources easily evokes the tactics of the Scorpion. 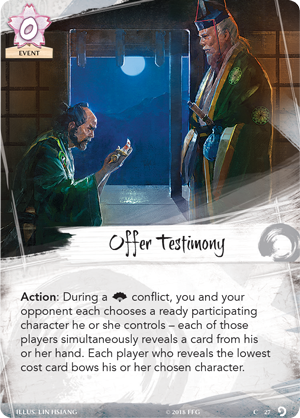 Offer Testimony (Underhand of the Emperor, 27) is a zero-cost event that sees each player presenting testimony in the form of conflict cards. If you reveal a conflict card that costs more than your opponent's card, your opponetn must bow his chosen character! The timing of Offer Testimony is key to its effects. If you have A Fate Worse Than Death (Fate has No Secrets, 98) or Consumed by Five Fires (Fate has No Secrets, 96) in your hand, you can feel confident in forcing your opponent to bow their chosen character. However, if you're forced to Offer Testimony with your hand full of zero and one-cost cards, you could easily find yourself facing the worst. While the battles in the courts and battlefields of Rokugan are epic in scope and feature bold, cunning and dedicated samurai, even lowly peasants still have their role to play in the Emerald Empire. Peasant's Advice forces one of your samurai to suffer the dishonor of conversing with a peasant. Still, even the most lowly peasants have knowledge that could prove useful. 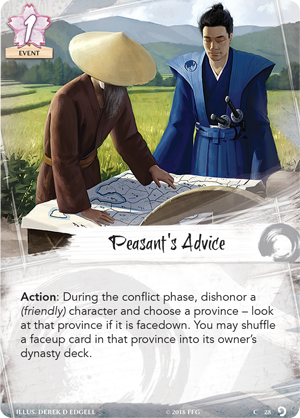 You can use Peasant's Advice to look a facedown province, and shuffle a faceup card in that province back into your opponent's deck. Of course, getting an early view of a province can help you plan your attack—a poorly timed assault on a Feast or Famine (Into the Forbidden City, 41) can ruin your forces, and Peasant’s Advice can be life-saving. 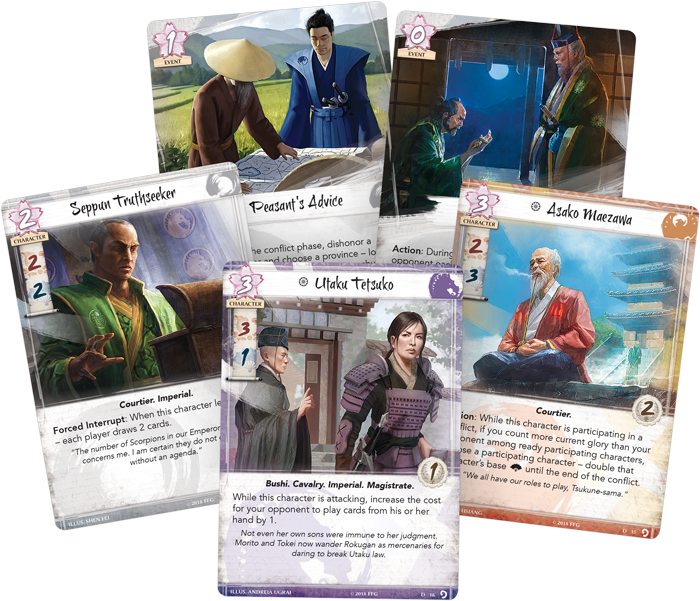 Furthermore, shuffling a dynasty card back into your opponent’s deck can effortlessly neutralize a threat like a Clan Champion before they even become a factor in the battle. While the Scorpion gain plenty of new tricks in Underhand of the Emperor, they are far from the only clan to receive a boost. 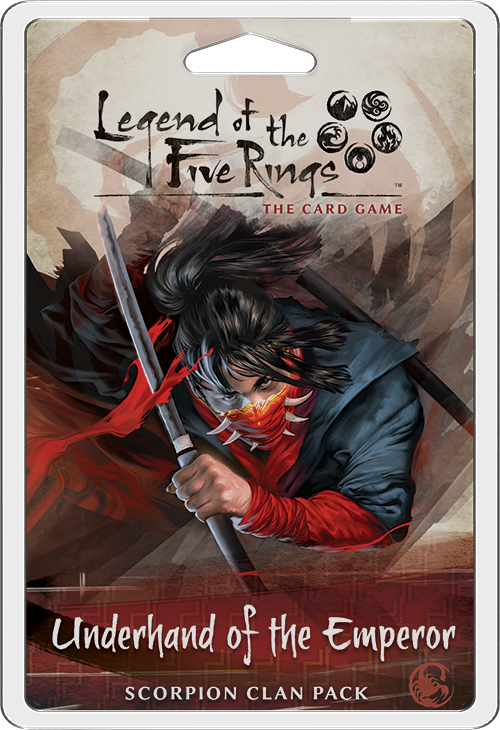 With characters for every clan, the Support of the Scorpion role, and powerful new neutral cards, Underhand of the Emperor promises to change the landscape of Legend of the Five Rings: The Card Game for years to come! 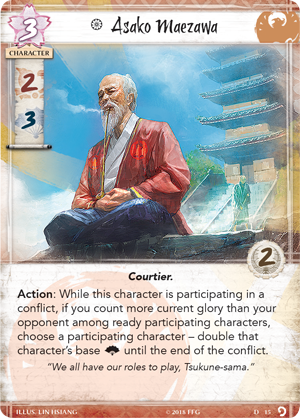 Prepare for your duty with the Underhand of the Emperor Clan Pack (L5C15), available now for pre-order from your local retailer or our website!